They taste soooo good and sweet that maybe you’re like me and looking for an easy way to preserve that amazing pepper flavor for winter. If you’re not looking to get set up pressure canning pickled peppers right now, why not try freezing some? I find it unfortunate that frozen veggies have a bad rap. And I understand, as I’m sure you’ve had frozen veggies from the store that were, to put it nicely, not that great. Plus you have limited freezer space, so you just can’t fit it all. And what would you do with them? I know that I’m good at forgetting about my frozen stuff come winter. But, I’m here to tell you that frozen peppers are actually really delicious and the best tasting and easiest way to preserve them that I know of! That they're worth the frezer space! And here are some awesome ideas to inspire you (and me) to make the most of them this winter! #1 They’re so EASY to freeze! Prepare your peppers: Wash and dry your peppers. Check for bad spots: Especially if you buy a bag of “seconds” from us, you’ll want to check the peppers and cut away any parts with defects or soft spots. Core and seed your peppers: Slice in half and remove seeds. Choose your shape: Either cut up your peppers into strips, rings, or chunks. However you think you’ll want them when you pull them out. Or simply leave them halved. Whole for stuffing. Or even freeze them whole without coring or seeding, which can be appropriate for mini peppers or hot peppers where you don’t care about eating the small seeds! 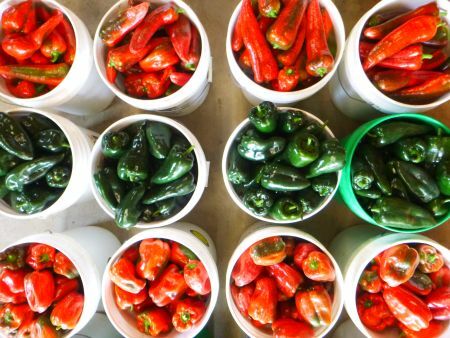 Keep in mind that whole peppers will take up lots of freezer space. Note: Keep your peppers dry! Don’t rinse them after you cut them up! It will help prevent freezer burn. Put them in freezer bags: Use heavy-duty freezer bags and remove as much air as possible from the bags to help prevent freezer burn. Yep that’s all you do. It’s so fast and easy that even my 2 year old can help. And she does! #2 Their flavor is still so GOOD TASTING after being frozen! My daughter even likes the red ones frozen right out of the bag raw for a snack. Yum! But, really, in cooked dishes, you’ll never know the difference as that same summery sweetness is still there! #3 They’re so EASY and FUN to use! Thaw: Remove your peppers from the freezer and allow them to completely thaw. This is easily accomplished by putting them in your fridge in a container to catch any juices that may drip. Or you can quick thaw them in a microwave. Drain the water: Frozen peppers may be watery if you skip this step! Lay your peppers out on a paper towel to remove excess moisture brought about in the freezing process. Throw into cooked dishes: They don’t need long to cook, so put them in at the end of a stir-fry for example. Frozen peppers will work in just about any cooked application you’d use a fresh pepper! Check out our favorite ways below to incorporate frozen peppers into dishes in the winter. Stir-fry: use other veggies fresh or frozen and add in peppers towards the end to warm through. I personally love to see that bright red or green color in my wintertime stir-fries! Soups: Use with other veggies in a veggie-based soup. So good! Or try a red pepper pureed creamy soup! They’ll warm your heart with memories of summer flavor! Fajitas: Slice your onions and sauté until browning, quickly throw in frozen peppers to warm through and voila you’re ready for fajitas. Italian sausage sandwiches/subs: Repeat above except put on a sandwich or sub. Yum! Pizza topping: Use them on a pizza! Easy and you won’t regret it! Chili: Throw them into a pot of chili towards the end. You’ll have your summer pepper flavor in your warming winter chili! Egg dishes: Scrambled in with eggs in the morning or in a quiche or frittata, fresh peppers are delicious with eggs and frozen are no different! The colder the better, so at 0 degrees they should last 6-8 months. That’s a pretty good long time! What kinds of peppers can I freeze? You can freeze any kinds of peppers this way: green, yellow, orange, and red bell peppers, Italian frying peppers, poblano peppers, other hot peppers, etc. Any kind of pepper will work well! What are your favorite ways to use frozen peppers? Let us know! If you liked this blog post, sign up for our email list below to get regular updates from us as well as a free gift!